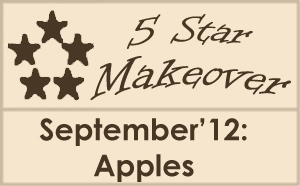 The 5 Star Makeover Cooking Group hosted by Natasha the 5 Star Foodie & Lazaro of Lazaro Cooks! is an outstanding monthly event for sharing ideas and creating gourmet makeovers of selected classic dishes or flavor combinations. September’s theme is APPLES. In a medium sauce pan over medium heat, sauté shallot in olive oil until soft but not brown. Add wine then reduce by half. Add cream, yeast flakes, and saffron whisking for 5 minutes. Season with sea salt and cayenne pepper to taste. 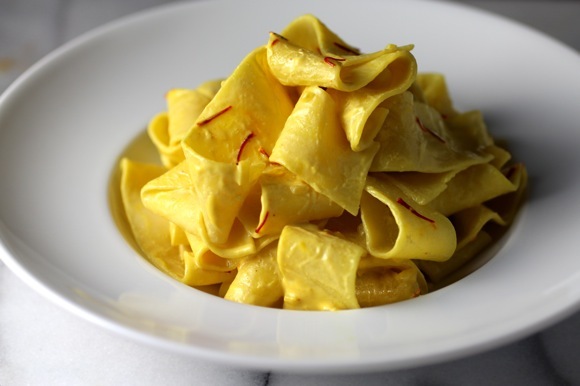 Toss pappardelle pasta with the saffron cream. Finish the dish with wedges of granny smith apple, fig, chopped pistachio, and a chiffonade of fresh mint. I wish all of you ~ my family and friends ~ a New Year that is sweet and good. May you be inscribed in the Book of Life for a healthy, peaceful, and fulfilling year. And may this new year bring satisfaction, achievement, and happiness. L’Shana Tova! Holy moly, this sounds delicious. Gorgeous! I can almost taste it through the screen. You’ve used some of my favorite flavors here. Happy new year, Lori Lynn! This pasta dish looks amazing! I love the meatiness of pappardelle and the saffron sauce sounds amazing! That is a wonderful meal to break the fast with 🙂 I love the saffron cream in combination with apples! Happy and healthy New Year! Your dish looks beautiful and I love how you got your inspiration for it. Now for the matzo balls and kugel recipes. I’d love to try yours as a new addition to our menu. Thanks for the wishes and a Happy, Healthy and Prosperous New Year to you and yours. You put together things I would never dream of, Lori Lynn, and bring them to life with your photos and words in the most magical of ways. Happy New Year to you, my sweet. Looks too pretty to eat. Very beautiful presentation and a creative recipe. I’ve never used two of the ingredients (cashew cream and yeast flakes), but I understand their contribution to the dish. Well done, as always, LL! BTW, saffron is such an under-used ingredient; yet, it totally transforms a dish from the aroma, to the look, to the taste. I’ll be posting a dish this weekend that features a yellow tomato saffron sauce and while the sauce started out as just something to bring it all together, it ended up being the star of the meal. Absolutely beautiful presentation! And a Happy New Year to you too! I love flavors you’ve combined in that lovely sauce. I have a bag of nutritional yeast in my pantry that I’m always looking for new uses for. 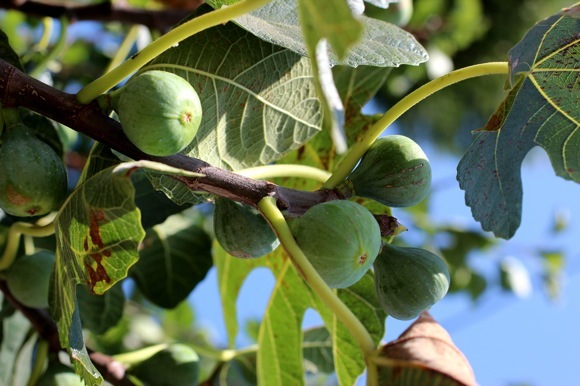 Happy that you used apple + fig — perfect for September! Oh that Saffron cream looks so good. Such a beautiful pairing and presentation. Happy New Year too you! These are flavors I never would have thought to combine, but it looks and sounds fantastic. So creative and novel. I’ve never used pappardelle pasta before but I think my kids like these fat and thick pasta. Saffron cream sounds goooood! Your ingredients are so simple yet you know how to produce the best flavor from all the ingredients. Very nice recipe as always! Have a nice weekend LL! It sounds amazing and looks fantastic!Love all the flavors,Lori Lynn! Another beautiful dish. 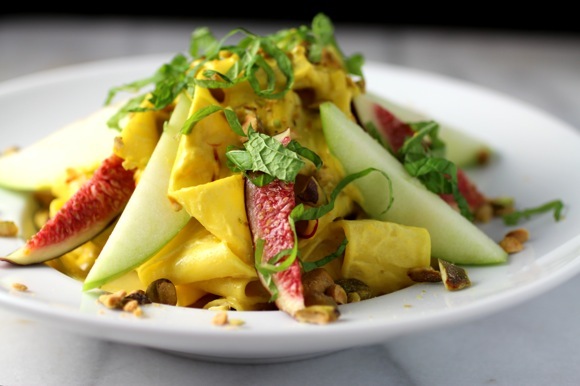 What a great idea to do the cashew butter and saffron. I am dreaming of that combination already. The flavors and colors are beautiful… a great dish for an apple challenge! What a beautiful, unique, creative dish with so many wonderful flavors. Happy New Year, and thanks for sharing all your gorgeous recipes! Five star challenge – 5 star dish! 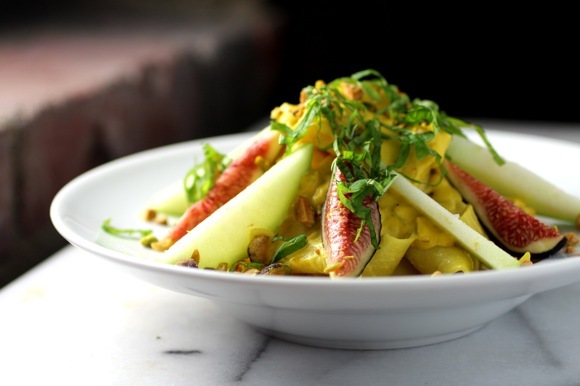 I could easily eat a bowl of the noodles with saffron cream alone, but the addition of the apples and figs really makes this a gourmet dish! Beautiful and delicious! The qualty of the photo matches the concept, flavor profile and presentation. The perfect storm of a perfect dish. This sounds delicious Lori! I love all the components here.. I don’t often cook with mint.. but I can really imagine the pairing with the apples and figs. And oh yum.. the crunch of pistachios!! Out of this world. I only have one thing to say…EXCELLENT !